To understand the disco era, you first have to understand sparkle. Sparkle was everything in the disco years, from the glittering disco balls that revolved overhead, to the multi-colored dance floors that lit up as you grooved the night away, to the cascading sounds of the synthesizers that propelled so many disco songs into a frenzy of celebration. It was flashy music for a flashy time, and if you were a disco fan you lived it inside and out. And of course that spirit extended to your apparel. 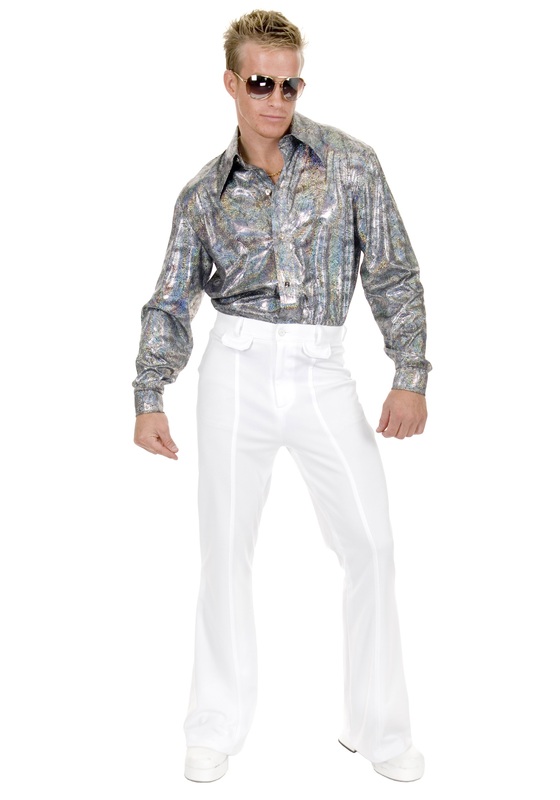 Bright, sparkling clothing was one of the most important elements of the disco experience. When you’re out there dancing your heart out to upbeat, good-time party music, you want to reflect the spirit of the occasion. With an glamorous outfit, you could let the spirit of the music shine through you, with every bass line and guitar riff sparkling out across the room as you became the boogie. “Disco fever” may have been just a phrase to some, but once you got yourself a good case of it, you’d never give a second thought to finding a cure. Get down with your sparkly self in this shimmering, synthetic shirt in an eye-catching silver and black knit with a funky swirl print. With an era-appropriate wide collar and shiny silver buttons at the center front and sleeve cuffs, it’s a bright, flashy piece of glamour gear straight out of music’s glitziest decade. It’s time to let your funky light shine.